If you work in professional sales or business development, objections are nothing new to you. Us sales folk hear objections every single day, and the objections are not going to stop any time soon. So if you can’t stop the objections from coming, you might as well embrace them. In my experience I have found that sales people, in anticipation of a particular objection, tend to jump all over their customers because their response has been practiced and rehearsed. This can leave the customer feeling like they were wrong for brining their point up, and they may even develop a negative perception of the sales professional. Try clarifying an objection by asking a sincere, relevant question. It’ll show that you care and will help you better tailor your response so it’s better received. Generally speaking most objections fall into two categories: objections rooted in theory, and objections rooted in experience. Objections rooted in theory are normally based off hearsay and often can be overcome by offering more detailed information. Sometimes just getting the customer to admit they only heard something gives you a good basis to share information that could persuade them. Objections rooted in experience may cause the customer to have a stronger objection. In my experience people communicate best through stories. 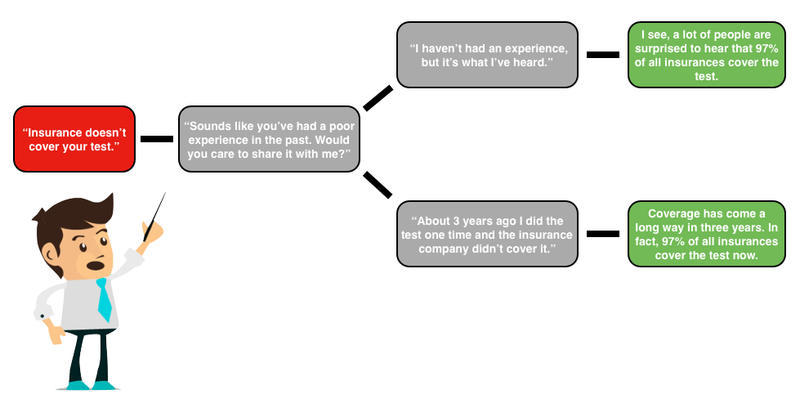 Knowing the customer’s story will allow you to form a link with them. As you respond to their objection it would be helpful to reference their own story and show them how the outcome could be different. Try it out and let me know what you think. Hopefully this post wrinkled your brain.